When do your children get their first wheels? According to the American Academy of Pediatrics, not until they are one year old and can hold their heads up. But from then on, the entire family can be out on bicycles. A baby bike seat makes riding with young children enjoyable. When considering a purchase, take into account the relative advantages and disadvantages of front and rear mounted seats or trailers, as well as your family lifestyle and your own physical abilities. 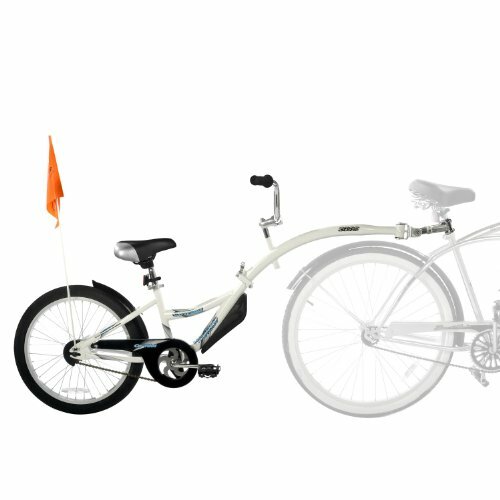 Credit: http://www.wheelhousebikes.com/cart_photos/09phys.3.jpegFront-mounted seats place the child in a forward-facing position behind the handlebars, over the center bar and between your legs. They are a popular option for younger children. The weight limit for front seats is 30 to 40 pounds. Advantages of front mounted seats are numerous. It's more stable to have the child's weight over the front wheel. The bicycle will be easier for you to handle. You will be able to see what your child is doing and compensate for his or her movements. Loading and unloading the child is much easier. 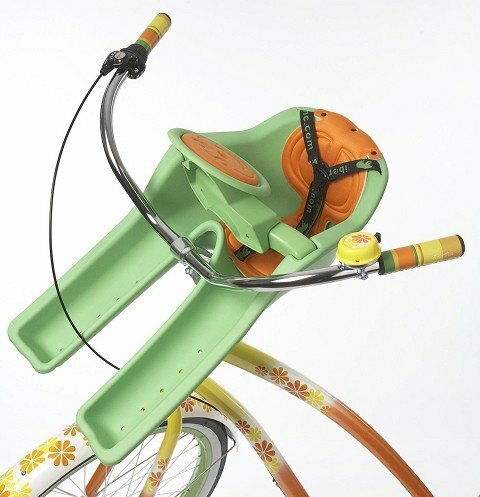 A front-mounted baby bike seat can make the ride very enjoyable for both of you. Because you can easily see and hear the child, the two of you can interact more easily. You can point out interesting things to look at, and your child can easily see ahead. You will notice instantly if your child falls asleep. 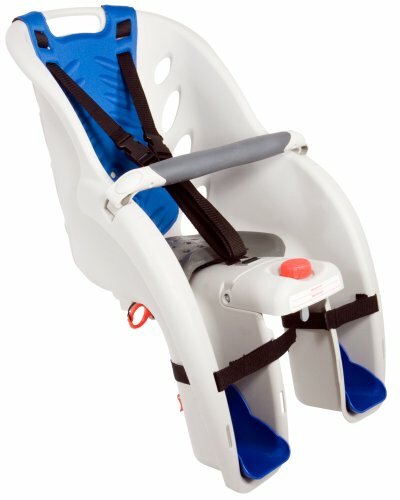 The iBert Safe-T-Seat Front Child Seat has a 3-point harness and lap bar keep your child safe while riding. The design also keeps your child's knees out of the way whilst pedaling. Disadvantages of front mounted seats include safety factors and your own comfort. If the child drops something, the object may get entangled in the spokes. If an accident causes you to fall forward, you risk landing on top of your child. The child is exposed to wind and bugs. Riding with a child up front means you need to reach around him or her to grasp the handlebars. The child is between your legs, so you may have to bend your knees outward. This can cause knee injuries. Having the seat up front also means you risk hitting the seat from underneath with your knees as you pedal. Front seats are for smaller children. As they grow, you will need to trade up to a rear seat or a trailer, which can carry more weight. This means the front seat will ultimately cost you more in the long run. Credit: www.hamax.comRear seats place the child facing forward behind you over the rear wheel. Rear seats are ASTM certified for children one year and older. Free to use the handlebars and to pedal without impediment. If there is a sudden stop or collision, you receive the impact first, not your child. The child is protected from debris. Rear seats can handle up to 40 or 50 pounds, and some as much as 75 pounds. You can use the same seat for a longer period and save money. The Schwinn Deluxe Child Carrier is a very popular, strong and lightweight rear, frame mounted bike seat. Since the child is behind you, you have less interaction, and less ability to monitor his or her movements. It's harder to get the child on and off the bike, and the bike is less stable with more weight in the rear. The forward view from the rear-mounted baby bike seat is blocked by your back. There is risk of the child's feet hitting the rear spokes. Bicycle trailers have two wheels and are pulled behind the bike. The American Academy of Pediatricians recommends trailers over bicycle seats for reasons of safety and stability. Still, there are many factors to consider. 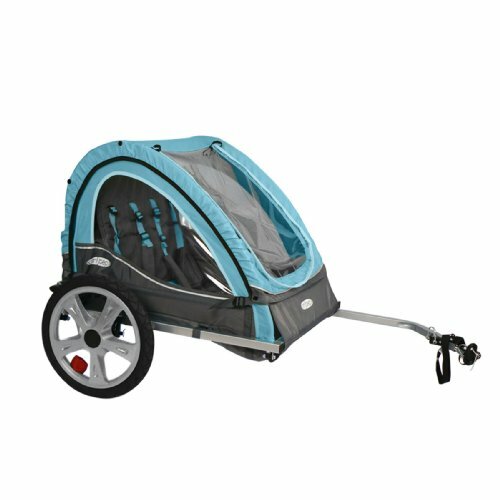 Many convert easily to strollers or joggers, and there are kits to convert them for skiing and hiking. Trailers will carry up to 75 to 100 pounds. Because the trailer is low to the ground, the child will not fall as far if an accident occurs. A low center of gravity makes them easy to maneuver. Trailers are level when turning, so your child has a more stable ride. Trailers are easier to sleep in. The InStep features a folding frame and quick release wheels allow for easy storage. Trailers are considered off-road vehicles. Because they are low to the ground, trailers are harder to see from a car. Because they are wider than the bike, the trailer may accidentally run over a curb and because they are heavier than seats, they are harder to pull, especially up hill or over long distances. They are also harder to handle. A trailer-cycle attaches behind your bike and has handlebars and pedals. Trailer-cycles are for older children, beginning as early as age three. A trailer-cycle allows children to pedal or coast, and prepares them for the day they are riding their own bicycle. The decision of whether you go with a front-mounted, rear-mounted or cycle trailer is a difficult one. Many proficient cyclists prefer the front-mounted style as they can monitor their child throughout the journey, but many people feel the rear mounted offers more protection to their precious cargo. Happy travels! And don't forget your child's cycle helmet.